The results from the Taste of Harvest competition. From managing harvests, submitting samples, and participating in high-level discussions, Congolese coffee producers, exporters, policymakers have been hard at work over these last few months—with the lead up to the Annual African Fine Coffees Association (AFCA) Taste of Harvest (ToH) and Conference being their primary focus. In February, several cooperatives and exporters driving DRC's specialty coffee boom participated in the highly-anticipated Taste of Harvest (ToH) DRC competition. Hosted in Kampala, Uganda, Congolese coffees took part the week before the annual conference. 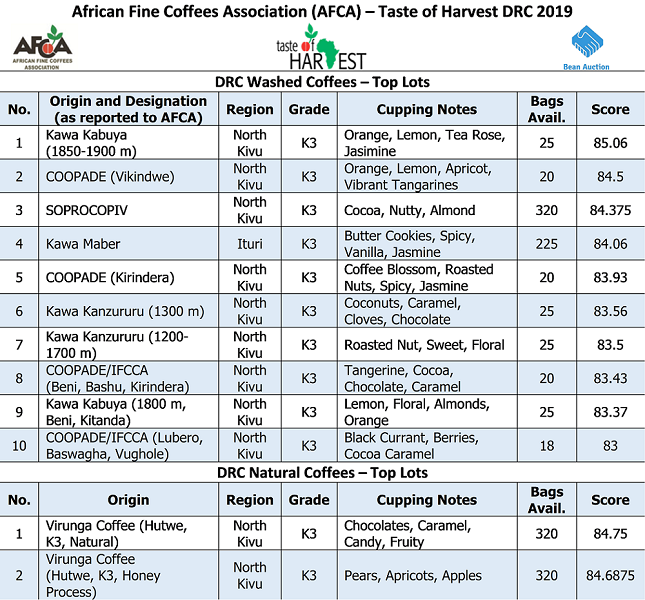 After calibration and two rounds of cupping, ToH DRC 2019 resulted in Kawa Kabuya capturing first place in the “Washed” category with 85.06, and Virunga Coffee Co. taking the top spot in the “Naturals” category with a score of 84.75. Of the 18 unique samples cupped, top lots are detailed below and for a limited time will be available through Bean Auction. To order samples, please contact please contact Tom Carew (tom.carew@beanauction.com).